This is a follow up on bug 820080 and I'd think the screenshot shows the problem adequately. I think the most pertinent info has already been posted at bug 820080 in comments 12, 13 and 14. I still have that install with the normal looking icon, but I know it will break when updated. While I don't normally use Xubuntu I burned 20111011 just to see what was going on and the same panel icon is broken in Xubuntu. Please look at the screenshot. First impressions count and since this was OK at one point can we get it fixed for release? This one effects me too, it only shows the broken icon when I plug in my power adapter though. I noticed that this still exists in the Lubuntu i386 live Precise 20111129 image during Alpha 1 iso-testing. Otherwise the DE looks very nice. This appeared to be fixed during Precise Alpha 2 testing but I need to follow up over the next few days. I'm unsure what effect this might have on bug 820080. 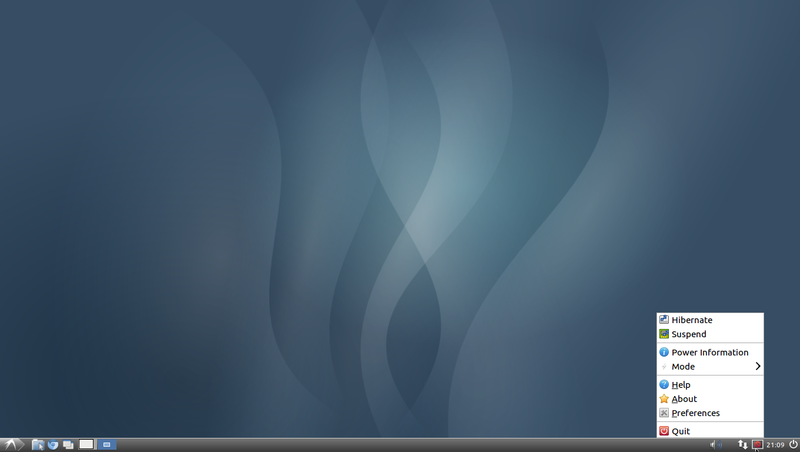 I added the following patch before the alpha 2 release: http://bazaar.launchpad.net/~ubuntu-branches/ubuntu/precise/xfce4-power-manager/precise/view/head:/debian/patches/xubuntu_fix-status-icon-other-devices.patch (from upstream br: https://bugzilla.xfce.org/show_bug.cgi?id=8188). It's supposed to fix broken icons for other devices (wireless kbd/mouse, etc. ), not for a normal battery/ups. That's why I didn't close this bug with the 1.0.10-4ubuntu2 upload, as I wasn't sure this is the same issue. Feel free to close it if it's fixed for you. I've been battling some hardware problems, not Ubuntu related, when I'm done there I'll check some new dailies of Lubuntu and Xubuntu to be sure where we stand but I think Lionel's patch fixed this. Many thanks. More testing is always welcome. Has there been any update on this? Can we consider it resolved? I've been testing the new Lubuntu and Xubuntu non-pae images and it looks good to me in both of those DE's, so I'd say it's fixed. Not sure what package updates fixed it but all looks well to me.